NASA will land in Mars, Pennsylvania Friday, June 19 to celebrate Mars’ New Year with Red Planet enthusiasts of the Keystone State for three days of science, technology, engineering, arts and mathematics (STEAM) activities. The goal is to encourage young people to pursue careers in in these critical fields of study that will enable NASA's journey to Mars. The Martian New Year occurs about every two Earth-years and is timed to the Northern Hemisphere Spring Equinox on Mars. That equinox occurs this month on Earth. 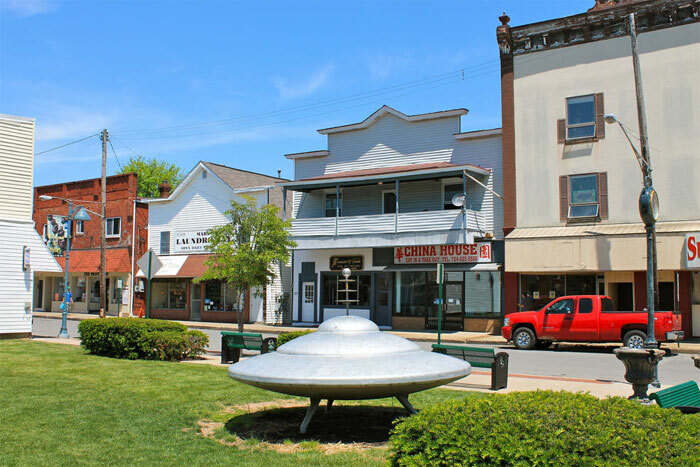 To kick off the three-day, Red Planet extravaganza, NASA will participate in a media briefing at 3 p.m. EDT on Friday in front of the town's flying saucer sculpture, located at 16046 Pittsburgh Street. After brief opening remarks and a question-and-answer session, media and social media will be given a preview walking tour of activities planned for the rest of the weekend celebration. Tyler Byers, Natalie and her sister Monica Swaney, all of Saxonburg, and Lisa Edwards of New York City wait for the costume contest at the Mars celebration in Mars. NASA has successfully made its first trip to Mars — the Butler County borough, that is — to celebrate the new year on the planet of the same name Friday and Saturday. The celebration marks Mars Year 33. Mars’s new year begins on the planet’s northern hemisphere spring equinox when the sun is directly over its equator at noon. Mars years last about 687 Earth days, or about 1.88 Earth years, so Mars Year 34 won’t begin until May of 2017. Scientists only began calculating the Martian New Year in 1955, which is why its now Year 33. Celebratory events at the main stage -- near the town’s landmark flying saucer -- ranged from scientific to silly on Friday, the celebration’s opening day. The Carnegie Science Center presented “Solar Quest,” a short film about the earth and its interconnectedness with the sun, and NASA gave a presentation on its plan to send humans to the planet in the 2030s. 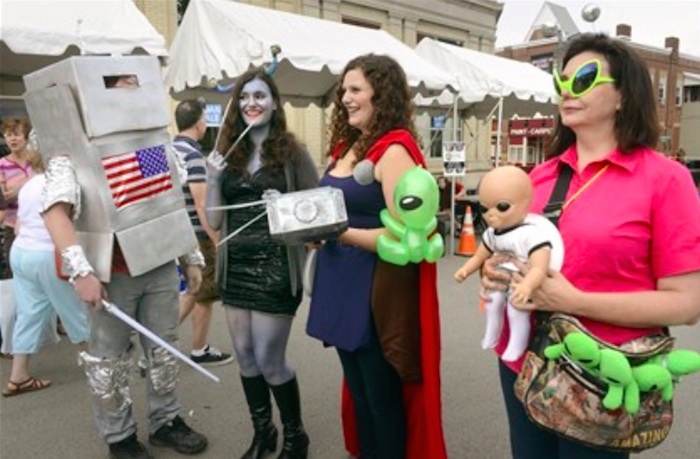 People of all ages were invited to dress up for the Space and Sci-Fi Costume contest. Later in the evening Jim Green, NASA’s Director of Planetary Science, delivered a keynote speech, followed by a screening of the trailer for “The Martian,” starring Matt Damon, about human travel to Mars, for which Mr. Green was a consultant. Mr. Green appreciated that the science fiction film and the book on which it is based are “a pretty good representation of what Mars is actually like,” and they deviate from the space battles and made-up alien races typical of the genre. Pittsburgh artist Dan Wilcox performed his one-man show, “Onward to Mars: A One Astronaut Space Rock Opera,” and Friday’s festivities ended with a fireworks display to celebrate the new year. According to Mr. Green, Mars is of great interest to NASA because it is the next logical step in space exploration. Before traveling to the moon, scientists gathered information about its surface and conditions. “We’re very close to having the same set of information necessary for humans to be able to go to Mars,” he said. Mars has a harsh climate and scientists at NASA must work on technology to allow astronauts to reach and live for an extended period of time on the planet’s surface, but “none of that is insurmountable,” said Mr. Green. Earlier this week, the discovery of methane in Mars meteorites suggested that life may exist under Mars’s surface. In order for human travel to Mars in the 2030s to become a reality, Mr. Green believes it must be an international effort. “There are so many countries willing to work with us, and we need to bring them into the fold,” he said. In addition to presentations and performances, NASA set up informational booths along Pittsburgh Street with STEAM (science, technology, engineering, art/design, mathematics) activities and information geared towards both adults and children, including a demonstration of a small rover capable of driving over lying bodies to simulate its functionality on Mars’s bumpy surface and an inflatable Mars rover replica to demonstrate the real machines’ size. Today, author and astronomer Diane Turnshek will speak at the Mars Library at 10 a.m. The “Journey to Mars” presentation will be repeated in the Mars Library at 11 a.m. and on the main stage at 2 p.m. Mr. Green will speak again at the main stage at 12 p.m., and the Mars Starz Jump Rope Team will follow him with a performance at 1 p.m.
Providing all goes well, both Mars Mayor Gregg Hartung and NASA officials hope to make the new year celebration an annual event — annual in Mars years, that is. 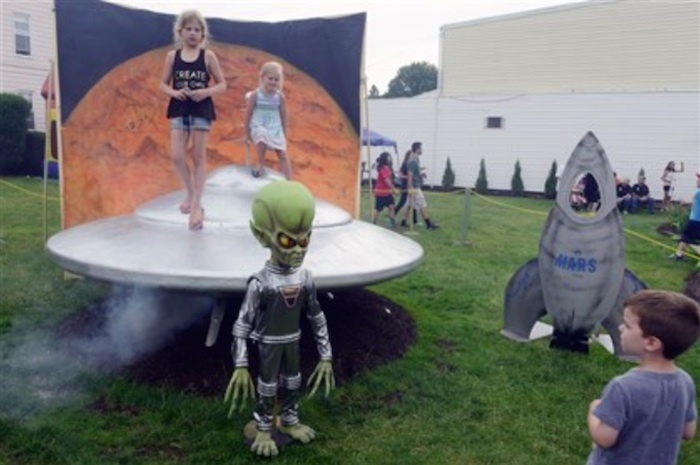 Katie Heffron, 8, and her sister Kelly, 5, of Scranton, come off the saucer where a Martian figure is added for photo ops Friday at the Mars New Year of Innovation, Exploration and Celebration in Mars. 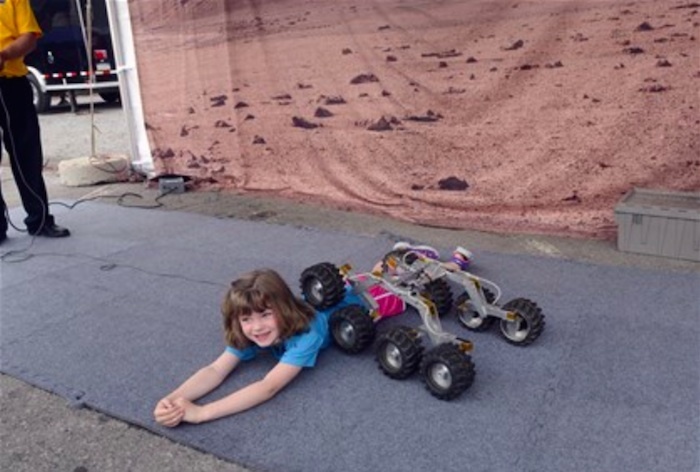 Hannah Utz, 6, of Valencia, has a NASA prototype Mars Rover run over her at the Mars celebration in Mars. 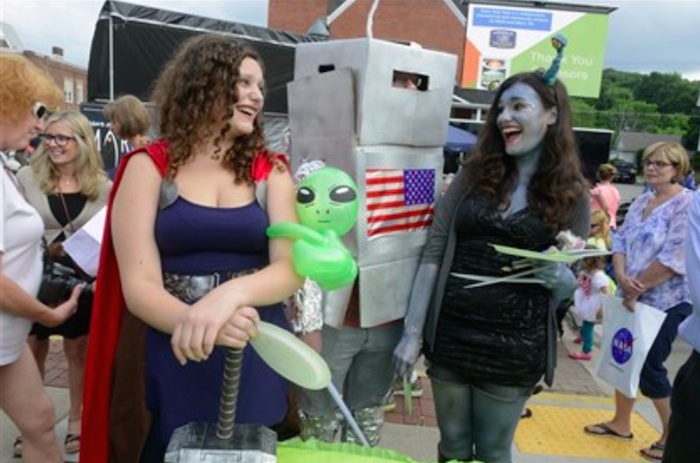 Monica Swaney as Thor, left, Tyler Byers as a robot, center, and Natalie Swaney as an alien, all of Saxonburg, dressed up for the costume contest at the Mars celebration in Mars. 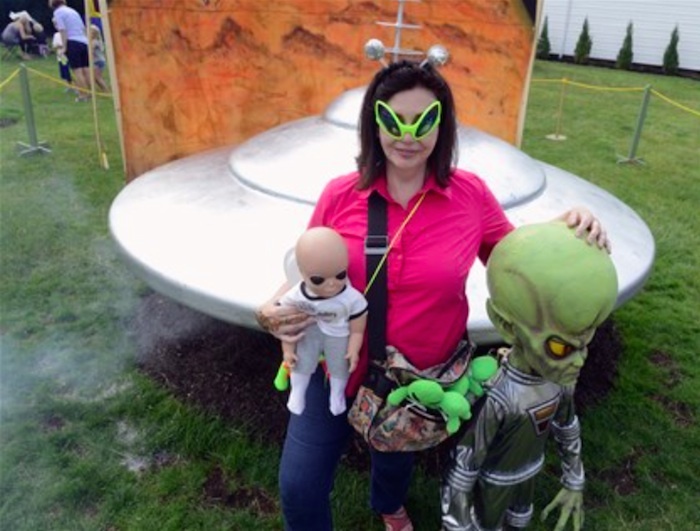 Lisa Edwards of New York City poses with a Martian figure by the saucer at the Mars New Year of Innovation, Exploration and Celebration in Mars.